Description: TOFC flys past La Grange Station while the Engineer gives a big wave. Description: BNSF Beardstown Sub. yard limits - 2 coal train pushers waiting in the yard. Description: BNSF Beardstown Sub. yard limits - 2 coal train pushers waiting in the yard with a BN caboose in the background. Description: BNSF Beardstown Sub. yard limits - 2 coal train pushers waiting in the yard with BNSF 9727 in the background. Description: Q669 with the 2 west coast powerhouses headed for Greenwood short on time. Title: BNSF or CSX Railroad? Description: NS train 703 had to swap motors around. Guess one went kaput. I think the SD70 went N/B LHF. 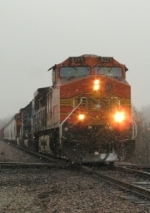 Description: A BNSF Train slams across the KCS Diamond at the Neosho Interlocking in the snow. Mike Richmond joined me down here this afternoon. Title: BNSF 4163 and a southbound Z-Train about to pass under NE 50th St. Description: Eastbound stacker at MP 66.